Your essential Canon EOS 5D Mark IV camera field guide in a convenient pocketable style. This EOS Pocketbook for the 5D Mark IV is a concise guide to your camera and small enough to carry with you everywhere. Nina Bailey, Technical Editor of EOS magazine and author of the popular EOS eBook series, has the solution. 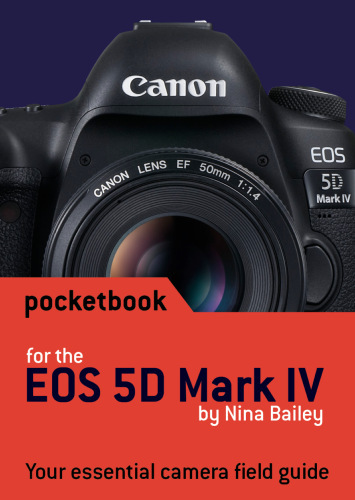 This new Pocketbook for the Canon EOS 5D Mark IV is a concise guide to the most used and confused features and controls on your camera, based on Nina’s vast experience as lecturer at EOS Training Academy – hearing first-hand what photographers want to know and understand about how their EOS 5D Mark IV camera operates. To be determined upon arrival. I have read it once and intend dipping into it again on photoshoots (or before). It seems to be an excellent guide and the focussing section has been particularly helpful. Very small booklet for £7.95.Bur contents were well written. A handy pocket guide. Another excellent booklet from Nina who really is THE expert on Canon EOS cameras. Pocket size is correct and so convenient to carry with you on all shoots. Information provided is extremely helpful and provides for a convenient quick reference tool to help you navigate your way through the comprehensive array of camera controls and options. Excellent easy view and conveniently sized reference book to carry with you in the field. Although I've been around Canon products for longer than I care to remember & had an EOS camera from their conception there is always something new when you buy a new Camera and these little field guides explain items in plain English - something the full manual doesn't always do, Keep up the good work Nina, these guides are a must for anyone who owns a Canon Camera, absolutely brilliant.